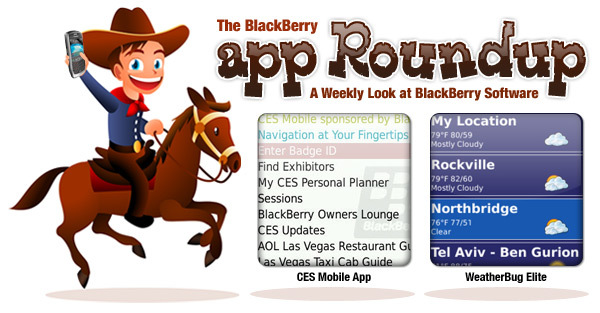 BlackBerry App Roundup for January 8th, 2010! I spellt and have such gooder grammar than ewe. Everyone can use a dictionary and thesaurus from time to time, right? 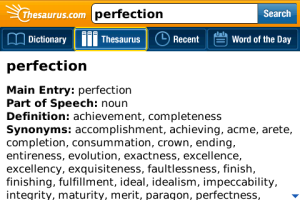 The folks at Dictionary.com recently released their Dictionary and Thesaurus app in App World (back on the 21st of December)... and it's worth a look. Besides the benefit of being a freebie, this app will help you out with more than 325,000 words and definitions... Plus 275,000 synonyms. Powerful to say the least, if you do a lot of writing on your BlackBerry, it may not be a bad idea to load this one up. Addicted to fantasy sports? Think you can pick more winners than everyone else? Project Vegas is a new (and free) app that claims to be the 'Ultimate Fantasy Sports Pick'em App'... and it's for BlackBerry only. The concept is simple. Pick over/under winners for matchups, and watch your account grow with virtual cash... cash that can be exchanged for real prizes. Earn virtual currency that can be cashed in for real prizes. Live Scoring: Follow your picks as the game happens. 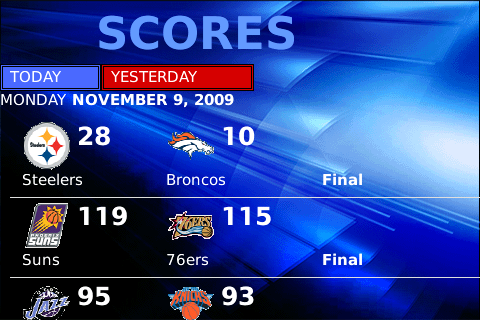 Game Reminders: Get email notifications when your favorite team is playing, and when your picked game is over. Game Schedule: See full game schedules for all teams. Add, Edit or Delete picks: Change your mind on a pick? Update or delete it right up until game time. Project Vegas is a free OTA download. Pick it up via http://www.projectvegashq.com/app. For more info hit up Project Vegas. Just in case you missed these titles, below are some apps that were covered in the CrackBerry Blogs this past week. Check 'em out! 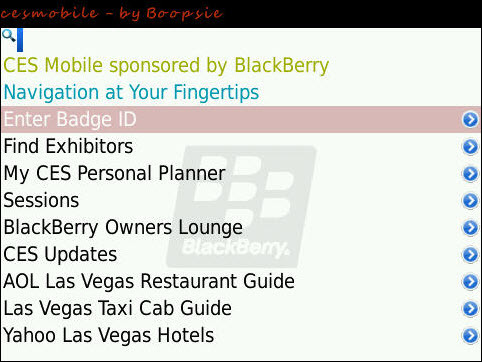 If you're already at CES, or are planning on hitting it up over the weekend, you can't go without the CES Mobile app for BlackBerry. Thrown together by the folks at Boopsie, the app will help you get the most out of CES. Search exhibitors, get live event updates, access a custom planner, and a whole lot more. Retweets - We support the old method and new method, you decide! Update Twitter Profile - Yes, you can update your Twitter profile directly from your phone. Profile Picture - We have heard you, upload a picture for your Twitter avatar right from your phone! Report Spam - One menu selection to report a tweet as a spam. Twitter Geo-Tagging - We provide support Twitter's new geo-tagging capability. You can decide whether to use myloc.me URLs, Twitter Geo-Tagging, or both! Larger Avatars - Click the profile picture, and view a larger version! You can even email that larger version! TwitLonger - Yes, you can tweet MUCH longer tweets now, thanks to the folks over at TwitLonger.com, we have fully integrated this capability into both sending long tweets, and automatically retrieving long tweets. We love it! What The Trend? - Ever wonder why certain topics were trending or what they meant? No more! We have integrated with the folks over at WhatTheTrend.com to allow you to see the explanations for trending topics, and also for you to provide your own explanations! Choice of timeline layout - Choose the new 'bubble' layout or the original 'bar' layout. Network Connection Logic - We re-worked the network connection logic, things should be alot smoother. For more info or to purchase for $4.99, hit up UberTwitter. Want to save the drain that WiFi has on your BlackBerry? SmartWiFi from S4BB combines cell tower and WiFi data to automatically turn your WiFi off when you're no longer in a hotspot. It's basically a hotspot optimizer, turning your WiFi on or off as you come and go from known hotspot locations (you can setup WiFi locations within the app). Save battery life by turning off WiFi when no needed. Remembers the WiFi locations you use. Up to 100 WiFi locations supported. Powers WiFi back on when you are back at WiFi coverage. Saves battery by avoiding your device to constantly check for available WiFi hotspots. Displays useful information: BSSID, SSID, Data Rate, Radio Band and Signal Level. Supported mobile devices: GSM / GPRS, CDMA and iDEN. You can pick up SmartWiFi for $4.99 through January 29th. This is hilarious... Hilarious, and you know what, actually kind of practical at the same time. I know some of you are going to pick this one up and use it! Massage for BlackBerry helps you give awesome massages by controling the intensity of the vibration coming from your BlackBerry. Dial it up for a more intense massage, and dial it down for something a little more gentle. Five different settings are built-in! All that is required here is OS 4.2. Note: An alternate version is available for the Storm. For more information hit up GyPSii in App World. Oh, and did I mention it's free? This very simple app from Enscand lets you find nearby biodiesel retailers via GPS (or ZIP code). Not only will it point you towards the location, but it will tell you the blends that are available as well, give you contact information for the station, and more. After you fill up, the Biodiesel Buddy will also track your fuel economy, and tally up how much CO2 you've saved. Cool! Biodiesel Buddy is on sale now through the end of the month for $1.99. Check it out here. With the NFL Playoffs kicking off this weekend, I thought it might be appropriate to include a little football love. That love takes the form of a new 'Gridiron' theme from Cellular Pros. Pretty standard stuff here when it comes to themes... There's a custom 'scoreboard' banner, custom icons, battery meter and more. There's 2 versions available, one for OS 4.7 and another for OS 5.0. Note: Unfortunately, this one isn't available for the Storm series. Qdial is a new app for the Storm series that lets you dial with insane speed. The app features 10 slots that are linked to 10 contacts in your address book. Once you have your 'slots' setup, click the corresponding call button next to the contact and you'll automatically call them. In a nutshell, this app basically lets you perform 2 click calling from your homescreen. Awesome. Qdial is available for $1.49 until the end of the month. Check out Qdial now! Think of BerryJoose as steroids for your BlackBerry... except it's legal, and there are no health repercussions. BerryJoose runs quietly in the background, optimizing your Berry's processes to improve your productivity and performance. It minimizes memory leaks, prevents bad connections and dropped calls, eliminates the need for so many battery pulls, and a heck of a lot more. All that is required here is a BlackBerry running a minimum of OS 4.2.1. BerryJoose is on sale now for $2.99 through January 10th. Pick up your copy here. Note: You'll need your device PIN number handy if you purchase. The app requires it. Display Current temperature and alert indicator next to the clock on the device's header. Plotted Lightning strikes points and NWS watch boxes on top of radar maps. 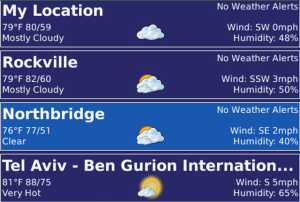 Shows the current conditions and the forecast for contacts and calendar events - based on their address. WeatherBug Elite is getting great reviews in App World. Check it out for yourself right here.